Wansink’s book explores the tricks marketers use to get us to buy their products and how our minds play tricks on us as well to justify our eating habits. He asserts (correctly) that we’ll never be able to lose weight based off of will power alone if we deprive ourselves of our favorite foods. Habits are the key. We do eat out of habit (mindless as Wansink calls it) and subconsciously for various reasons. Some are from our childhoods. Others are from watching others’ patterns. But most are not for sustenance. 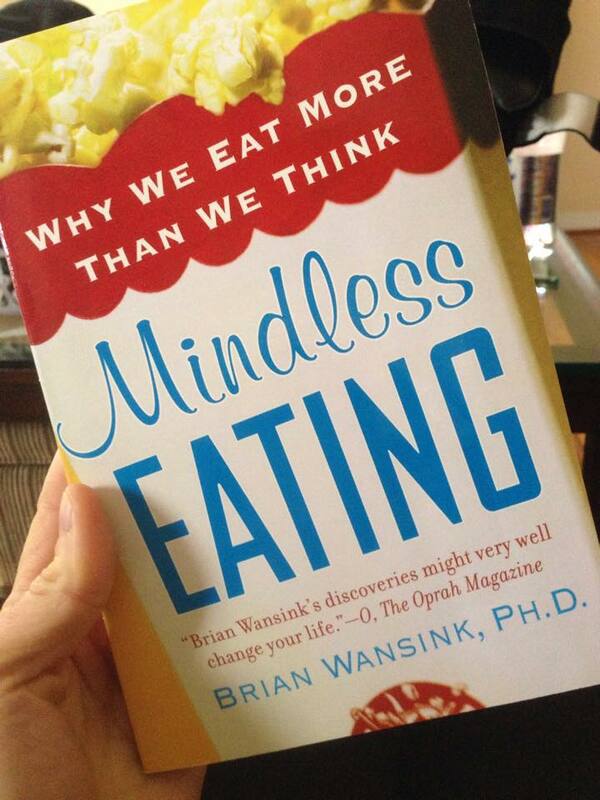 Wansink’s research shows we eat from habits, some formed since childhood, and without thinking. This leads to weight gain over time. His solution: Cut 100-300 calories a day in 3 simple changes you commit to that will cause a weight lose over a year of 10-20 pounds that are mindless. You do this by food trade-offs and food policies, both of which give you the chance to eat some of what you want. Other recommended tricks: buy smaller plates, which tricks the mind into thinking we are eating more than we actually are, don’t eat out of the package or standing in front of the TV, don’t put food on the table while eating–make it inconvenient to get up to get seconds, don’t eat in front of the TV, and beware of “low-fat” alternatives that trick us into eating more. We make over 200 food choices a day (from what to eat to walking by the candy dish). We don’t have the mental will power to resist all the “no’s” caused by these 200 decisions every day. Thus: change your environment. Out of sight, out of mind works. Get rid of the food on your counters and put the “bad” food or high-calories foods in the back. Make it harder to get to these. Make it easy to grab celery and carrots. No see through containers either. The more inconvenient good is, the less likely we will consume it. This is doable for most people. Most people won’t go exercise more. But they will not eat that slice of cheesecake if it’s on your “no food” policy list. Accountability is you checking this off on a calendar at the end of the day if you followed your simple 3 rules. I love this idea because for me 100-200 calories is easy to do. And Wansink says your body won’t miss the calories like it would if you were trimming 500 or more calories per day. Hence, your adherence will be much higher. Either cut the sugar I put in my coffee by half or use a sugar-free alternative. Don’t buy icing (my one weakness I can’t resist when it’s in the house). Don’t eat past 6 pm at night. Overall great read on how our minds work around food and the tricks marketers use to get us to buy their products over their competitors. I love the premise of small changes leading to big results. Highly recommended for those who find diets and exercise challenging. This is a way to start small and go from there!